TENEMOS UN NUEVO FOLKBOAT EN LA ANFE, SE TRATA DEL PALOMEKE DOS, DEL REAL CLUB NAUTICO DE MADRID QUE NAVEGA EN EL PANTANO DE SAN JUAN. EL ASTILLERO ES A.B. MARIEHOLMSBRUK DE SUECIA Y ES DE 1970. ES DE FIBRA SIN TINGLADILLO. DESDE LA ANFE QUEREMOS DARLE LA BIENVENIDA. the Board of NFIA herewith invites you on schedule to the ‘Annual General Meeting’ (AGM) in 2012 which will take place on Friday, July 27, 2012 in Sandhamn / Sweden starting at 6:00 pm. The exact address of the location will be communicated on the ‘Black Board’ of the Gold-Cup Race Office. As to the Articles of NFIA each National Association has to confirm in writing to the Secretary (NFIA-office@gmx.de) the name of their representative, who will personally attend the meeting. He has also to be prepared to provide the number of boats registered in his Association. This drives the number of votes the Association has. Nos remiten desde la N F I A, Nordic Folkboat International Association, el pimer anuncio de regata al que hemos sido invitados. Sé que enviar unos de nuestros barcos a Suecia puede ser un poco complicado pero podríamos plantearnos alquilar un folkboat alli. 1.2 If there is a conflict between languages the English text will take precedence. 1.3 Competitors must wear personal flotation devices when the boat has left port, except for short-term replacement or adjustment of clothing or personal equipment. Wet suits and dry suits are not personal flotation devices. A boat that violates this rule may be warned or punished at the discretion of the Protest Committee. 2.1 Boats may be required to display advertising chosen and supplied by the organising authority. 3.1 The regatta is open to all boats of the Folkboat class. 3.2 The helmsman shall be a valid member of the yacht club, which he represents and also a member of a national Folkboat association under NFIA. 3.3 The person in charge onboard the boat shall be a member of his/her Member National Authority or one of its affiliated organisations. 3.4 Advance entry shall be made online not later than 1 July 2012 atwww.ksss.se/goldcup. 3.5 The advance entry shall include the following: name of the regatta, race class, letters, sail no., skippers name, address, telephone no., e-mail and yacht club. 4.1 The entry fee is 2.700 SEK and is paid at the entry registration. 10:00 First warning signal Two races are scheduled. 10:00 First warning signal One race is scheduled. After Sail with Daily First after the race. Information about all social events will be published atwww.ksss.se/goldcup. 5.2 Six races are planned. 6.1 Each boat shall produce a valid measurement certificate. Measurement checks will be performed. 7.1 The sailing instructions will be available at the Race Office after completed measurement checks. 8.1 The racing area will be east of Sandhamn. 9.1 The courses to be sailed will be windward/leeward courses. 10.1 Rule 44.1 is changed so that the Two-Turns Penalty is replaced by the One-Turn Penalty. 10.2 Decisions of the jury will be final as provided in rule 70.5. 11.1 Four races are required to be completed to constitute a series. 11.2 When fewer than five races have been completed a boat’s series score will be the total of her race scores. 12.1 Boats shall be kept in their assigned places in the harbour at Lökholmen. 13.1 Keelboats shall not be hauled out during the regatta except with and according to the terms of prior written permission of the race committee. 14.1 Underwater breathing apparatus and plastic pools or their equivalent shall not be used around keelboats between the preparatory signal of the first race and the end of the regatta. 15.1 Except in an emergency, a boat shall neither make radio transmissions while racing nor receive radio communications not available to all boats. This restriction also applies to mobile telephones. 16.1 The Gold Cup for Nordic Folkboats, the prize of senator Hagelstein will be awarded to the winner according to the Gold Cup Stautes. KSSS prizes according to the number of boats entered: one prize for every five boats or part of five, until a maximum of eight prizes. Daily First prizes will be given after each day of racing. 17.1 Competitors participate in the regatta entirely at their own risk. See rule 4, Decision to Race. The organizing authority will not accept any liability for material damage or personal injury or death sustained in conjunction with or prior to, during, or after the regatta. 18.1 Each participating boat shall be insured with valid third-party liability insurance. 19.1 For further information please contact: Racing Manager: Anna Klange, anna@ksss.se KSSS Office: +46 8 556 166 80 Visit KSSS websitewww.ksss.se/goldcup for information about accommodation and social activities. Mooring Competing boats do not pay mooring fee at the KSSS marinas in Sandhamn/Lökholmen between July 25th and July 29th. The iron ballast keel represents more than half of this displacement making the Folkboat extremely stiff and seaworthy, and it is one of the smallest craft to have made regular ocean crossings and circumnavigations. In the 1950s, the Folkboat began to attract the attention of long-distance voyagers for its modest cost and seaworthiness. Ann Gash from Australia, who made a single-handed circumnavigation in Ilimo between 1975 and 1977. 1962/1963 Adrian Hayter sailed single handed from New Zealand to the U.K.in ‘Valkyr’ by the Westward/Panama route. Lt. Col. H.G. “Blondie” Hasler sailed a greatly modified folkboat Jester to second place in the first Observer Singlehanded Trans Atlantic Race in 1960. 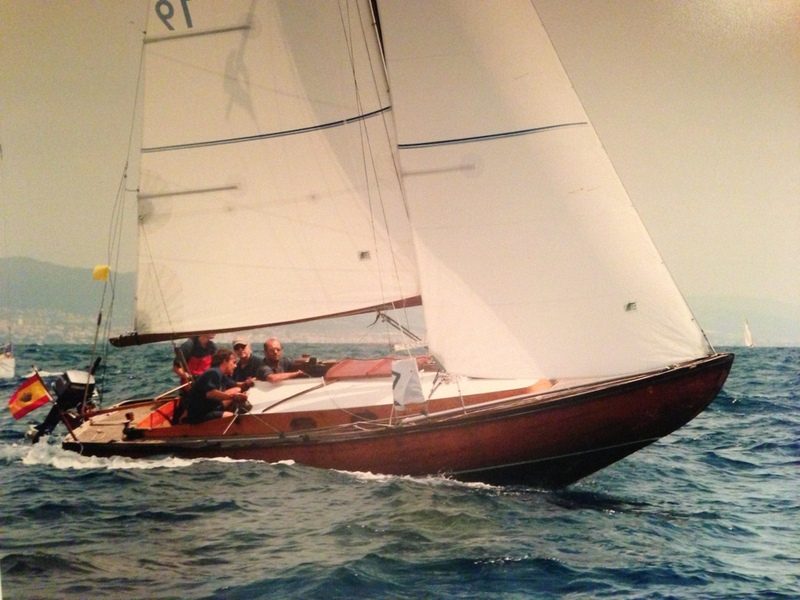 Mike Richie sailed Jester in several Singlehanded Trans Atlantic Races until Jester was damaged and lost at sea. Richie survived and competed for many years in a replica of Jester. Rozelle Raines sailing Martha McGilda in which she was the first British Woman to sail singlehanded to Russia in the 1960s.